I stumbled upon a TEDx video about McMansions. The young woman doing it is apparently very interested in architectural design and the homes she criticized where bloated monstrosities but really didn’t fit my concept of a McMansion. Michael Keaton starred in the movie Founders in 2016 about the early history of McDonalds. It’s the story of Ray Kroc, who turned the restaurant idea of the brothers McDonald into a franchise empire that made Kroc fabulously wealthy. It’s an interesting movie with a sad ending but the point of mentioning it was that Kroc took the original concept of consistently delivered fast food and perfected it by systemizing it and duplicating it over and over again. The food had to be satisfying but not require trained chefs in the kitchen and the menu seldom changed. Most of all, the quality had to be consistent if not outstanding both day to day and store to store. Importantly, the product had to be affordable. Back to McMansions…As in the TEDx talk, the term is used derisively…at least by architectural critics. The homes she featured in her presentation were probably deserving some criticism. I’m not so snotty. If your dream home makes you happy, who cares what the critics say. What she used as illustrations where mostly very large homes (4000-5000 square feet or more) and apparently custom built on large lots. What I would label a McMansion only shares two things with those homes; a little dash of pretension and a bit outsized, maybe topping out at 3000 square feet or a little more. They may also be aspirational for the lower middleclass folks with incomes well below the 10% of top earners. What makes them McMansions in my reckoning is how they are produced. Think of a Quarter Pounder with Cheese that can satisfy your hunger without being special or breaking the bank. McMansions are usually in well laid out developments and usually built by large national companies. 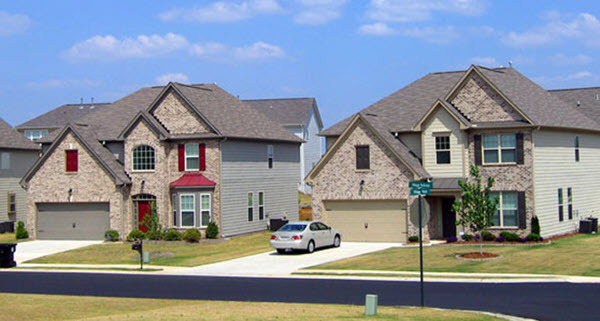 The lots are the minimum size for whatever zoning exists. They go up and not out…that is, they are usually two story with few ranches. Finishes are usually basic, for example there may be no trim around windows (inside or out,) little crown molding and the most basic baseboards, etc. The number of floorplans are limited and will be repeated many times in a neighborhood. What’s good about them and why I don’t disparage them? First of all, they’re market tested. The floorplans work for most families. They often come with some nice amenities like a community pool, small parks, maybe even a few tennis courts. At least on the interiors, they have a minimalist appeal that offers the opportunity to decorate for many different tastes. In older McMansion neighborhoods you may forget that they were mass produced. Over the years, owners will update and make modifications and create some unique landscaping removing some of the sameness of the neighborhoods when they were built and they become very desirable. But most of all, they are often a terrific value for the money, especially for young families and that’s why you will see a lot of them. The original McDonalds were successful with little direct competition but as Burger King, Wendy’s, Hardees and other fast food franchises developed and competed they all had to experiment with different menu items, more comfortable spaces, etc. The same can be said for the mass market housing industry.